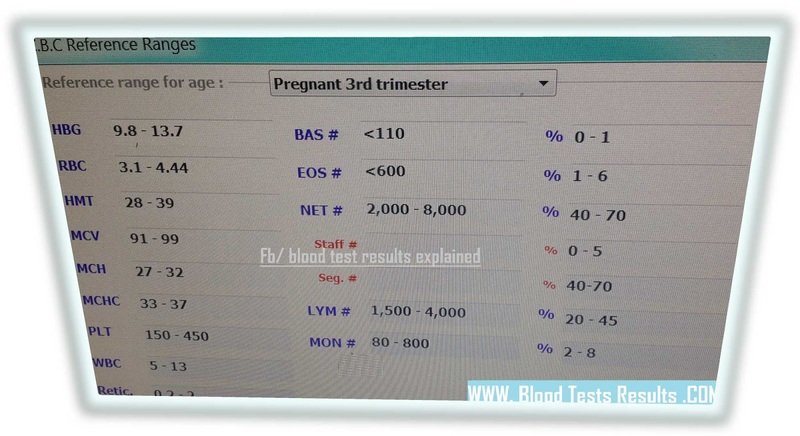 Normal allowed values of CBC test through third and final trimester of pregnancy. Do not forget that pregnancy divided into three physiological terms each of which is 12 weeks and including physiological changes to the body and blood circulation. Third pregnancy trimester started from the week 25 to the week 36 after LMP. At the birth, large events to the mother’s body cause seriously decreases in blood counts which cannot considered normal,nevertheless, the situation need more urgent medical action. My CBC test show very low values, should I worry?..I am in the last trimester of pregnancy. A pregnant women in the final weeks usually find her hemoglobin value as low as 9.8 grams per deciliter, it is a normal values for such time period, doctor may or may not prescribe supplementation. RBCs and HCT values are usually seen lower than those in previous CBC for 2nd term of pregnancy. Total white blood cells count decline to 13,000 cells per microliter of blood with differential count and morphology equal to those in 2nd term values. Anemic cells usually seen in last term of pregnancy in the blood film, such as target cells. Need help for your results, please visit Fb Page or contact us by email. my hemoglobin too low, what’s that?